Sorry that it's been a while since I've put up recipes! It's been rather busy, but I'm hoping that I'll be able to get in the rhythm of posting recipes regularly again! Here is a quick and delicious dinner idea that's ideal for using up any leftovers you have in the fridge. 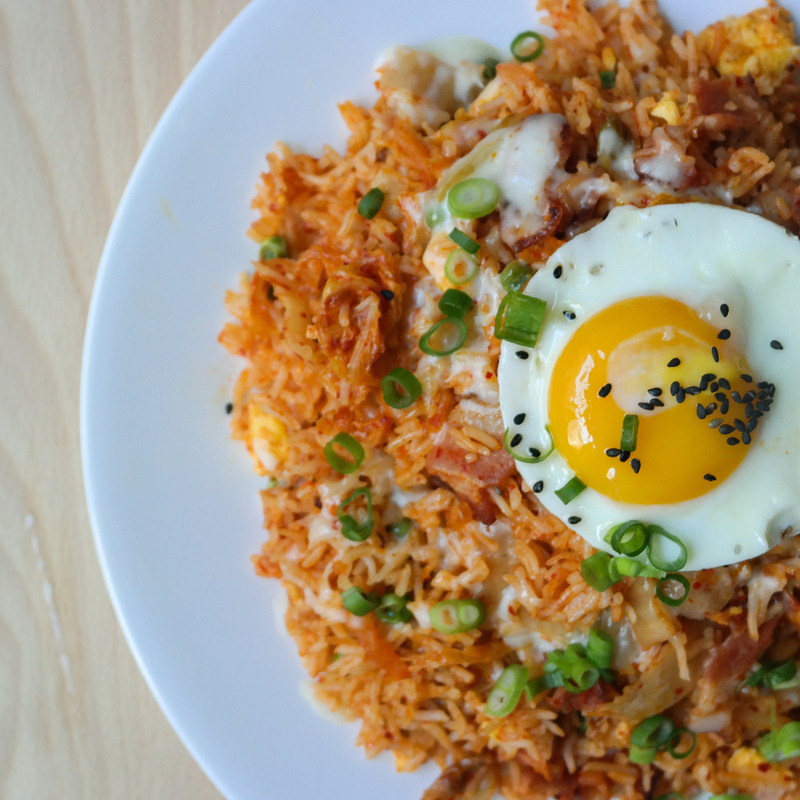 I love fried rice, because you can pretty much use any combination of ingredients that you're in the mood for, and it'll turn out great! You may also use any type of rice (as you can see in the pictures, instead of plain white rice, I used Indian basmati rice, since that's what I needed to use up), but just remember-- the key to good fried rice is to use rice that's at least a day old. If you use fresh rice, it will be too wet (think of all the water you put in the rice cooker! ), and it will not turn into fried rice. I adapted this recipe from the incredibly talented Chef David Chang, the mastermind behind the Momofuku restaurants, and chose to also add cheese to it, but feel free to substitute with any ingredients of your choice. Another key to good fried rice is to keep the heat on high and to cook the ingredients in batches! 1. Prepare all of the ingredients. Place the frozen peas in a bowl of cold water. Crack the eggs into a small bowl and lightly beat with a fork or whisk. Chop the bacon and the kimchi, and dice the onion. 2. In a wok or skillet, heat a healthy amount of oil on high heat until very hot. 3. Add the onions, and cook them until translucent, but not browned (about 2 minutes). Transfer the onions to a bowl and set aside. 4. If there is no oil left in the skillet, add a little more, and cook the eggs. Scramble them with a wooden spoon, and cook them for less than 30 seconds, so that they are still soft and runny. Transfer the eggs to the same bowl as the onions. 5. Add the bacon to the skillet. Cook them until crisp, stirring constantly, for about 5 minutes. Remove them to the same bowl as the eggs and onions. There should be about 2 Tablespoons of bacon fat left in the skillet. If there is more, remove some. If you wish to not use bacon fat, you may wipe the skillet clean and use olive oil instead. 6. Add the rice to the skillet. Cook for about 5 minutes, stirring so that the rice does not stick to the bottom. 7. Add the bacon, eggs, and onions back to the skillet. Add the peas, kimchi, and kimchi liquid. Cook for about 5 more minutes, stirring so that everything is mixed evenly.